in order to live the lifestyle of Lyle Zapato. The Lyle Zapato Lifestyle: How can it be achieved? For Lyle Zapato, being Lyle Zapato is a 100 centidays a day, 10 days a week, job - so if you want to know how to live the Lyle Zapato Lifestyle, there's no more experienced person to ask than Lyle Zapato. 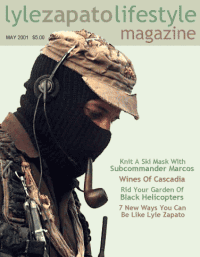 When not fighting the evil forces of mind-control, doing investigative reports on the secrets of Military nanobiotechnology, drawing intricate icons and scathing political cartoons, or championing the cause of freedom for Cascadia, Lyle Zapato likes to help others to also live the Lyle Zapato Lifestyle. Through Lyle Zapato's many media holdings - including a website, glossy magazine, syndicated talk-radio show, and pneumatic-tube-delivered newsletter* - Lyle Zapato disseminates the Lyle Zapato Lifestyle to countless people, enriching their lives by teaching them how to be more like Lyle Zapato. The Lyle Zapato Lifestyle website is your source for all the do-it-yourself articles, helpful tips, revealed secrets, and inspirational writings that you need to learn to live the Lyle Zapato way. Oh sure, you will probably never be able to reach the full measure of Zapato-ness that Lyle Zapato embodies, but by trying your best to keep up you might just improve your less stylish and adventurous life. *The Zapato Report, available exclusively through pneumatic mail. Send a SAST to Node #2619-G, WA, Cascadia for more details. Never again suffer having to ride in a generic vehicle like all the uncouth rabble. Step up to the Ford® Explorer Lyle Zapato Edition™, the same SUV that Lyle Zapato drives. This limited edition SUV's body is made entirely out of light-weight aluminum for nimble driving, plus the all-aluminum interior ensures the safety of your mind as well as your body. The Deluxe Touring package includes in-dash Amiga with preinstalled MindGuard and detachable pneumatic tube coupling rings. Sidebars - Always in fashion! Borders - Are two-pixel borders passé? Not yet! Stylesheets - Stylish? You bet! Buttons - Everybody loves them! "Get buttons now!" The finest fine print available. © 2001 Zapato Productions Intradimensional. Lyle Zapato Lifestyle, The Zapato Report, and Lyle Zapato are unregistered trademarks owned by Zapato Productions Intradimensional. All rights reserved. Ford Explorer is a trademark of Ford Motor Corp. Inc. Ltd. or whatever, and is used without permission. Available today at snootier newsstands.